Down on the beach next to the Dubai Offshore Sailing Club and the fishing harbour there's a stink: raw sewage is flowing into the sea close to prime tourist beaches. 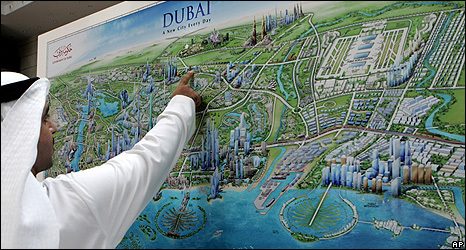 The putrid problem is caused by the illegal dumping of untreated sewage in Dubai's inland storm drain network, as the city's rapid growth outstrips its infrastructure. At Dubai's only sewage treatment plant there are long queues and serious delays. Truck drivers who are paid by the lorry load to collect waste from the city's septic tanks wait for several hours to dispose of their foul cargo legally. There simply is not the capacity to deal with all the human waste the city dwellers produce. After dark some drivers are taking a shortcut and dumping their loads straight into manholes meant only for rainwater. 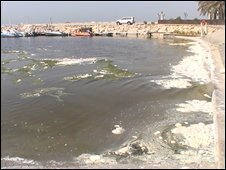 The result is raw sewage flowing directly into the once-clear blue sea of the Gulf - right next to prime swimming beaches. This is bad news for a city which depends on the tourists who flock to its shores. The city's municipality has already closed one beach and says it is trying to catch the culprits. It has imposed fines of up to $25,000 and threatened to confiscate tankers if the dumping persists. "The municipality has tracked and caught drivers - many over the last few days," said Mohammed Abdul Rahman Hassan, Head of the Marine and Environmental Protection Section at Dubai Municipality. The municipality maintains that its latest test results show samples of the water are "within the standard". "Samples were taken from three locations - the harbour, near the outfall and on the beach," explains Mr Hassan. "It is safe according to our report - within the safe limit." But independent tests arranged by the sailing club show the water to be highly contaminated with bacteria and the human faeces floating in the sea. 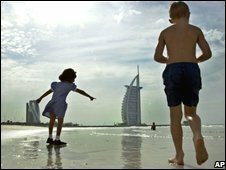 "Our tests show the water is not safe," said Keith Mutch, General Manager at the Dubai Offshore Sailing Club. "We have had to cancel sailing lessons until further notice - until there is a clean bill of health." So far there has been no contamination found near the city's five-star hotel strip but that is just a short distance along the beach and if the research done by the Sailing Club is anything to go by the pollution could get worse. "I have been out in the middle of the night following these tanker drivers," said Mr Mutch. "We know what they are doing, and we know that they are doing it because there is a huge wait at the sewerage plant. This contamination is definitely happening elsewhere in the city." Only one storm water outlet is currently open but when the first rain comes to Dubai this winter other parts of the system, including those near the smart hotels will also need to be used. No-one yet knows exactly what those pipes might contain but everyone is hoping that something can be done before there is a need to find out.